October 23, 2015, Django’s Rough Bar Café opened serving small plates, chowders, fresh seafood, cool salads and sandwiches served on house made bread. Owners Linda and Dusty Dillon have employed Odile Perkins (formerly of Sharon’s) in the kitchen. Local wine and regional craft beer paired with local food make Django’s a true locavore experience. A unique selection of non-alcoholic beverages includes juices, teas and some tempting sodas. You may enjoy a seat at the inside bar and tables, but the deck is the place to be. Covered with sun sails and surrounded by glass walls, the view is the best in the harbor. Friday, Saturday evenings and Sunday afternoons local musicians perform on the outdoor stage. The atmosphere is congenial and the audience sociable. Why the name Rough Bar? Bar is a nautical term for a harbor or river bar where a sedimentary deposit forms at the harbor entrance or river mouth. Bars are formed by the deposit of freshwater sediment and/or the action of waves. In this case, the Noyo River meets the Pacific Ocean and forms the Noyo Bar (video of Noyo Bar). It’s within sight of Django’s. The Noyo Bar is called a ‘rough bar’ because it is just that – rough – at times torturous if you are crossing it. Here is an exciting video – a Coast Guard rescue of three people from a boat that capsized on the Noyo Rough Bar. Don’t worry, sitting on Django’s deck is perfectly safe. What about the Django’s part of the name? It’s one of owners, Linda and Dusty Dillon’s, favorite musicians, guitar virtuoso, Django Reinhardt. 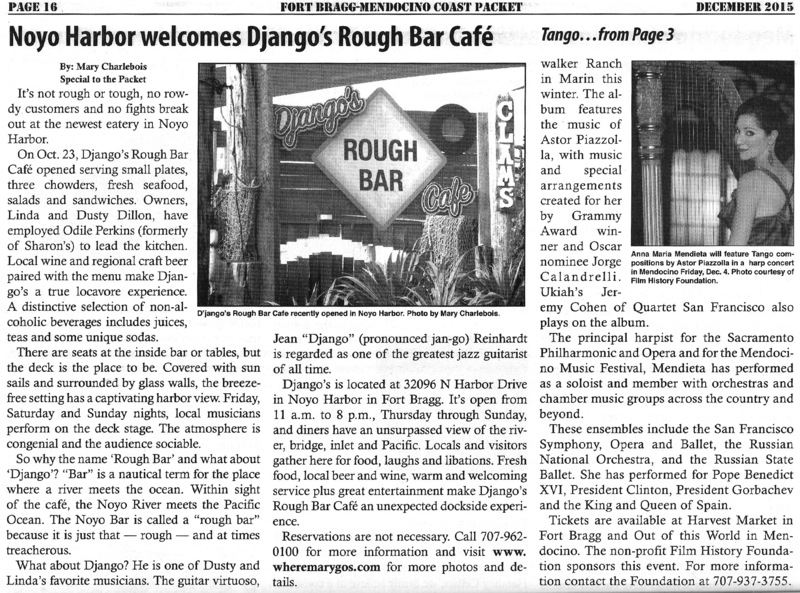 Django’s Rough Bar Café is located at 32096 North Harbor Drive in Noyo Harbor, Fort Bragg, California. They are open from 11 am – 8 pm, Thursday through Sunday. You will have an unsurpassed view of the river, bridge, inlet and Pacific. Locals and visitors gather here for food, music, laughs and libations. Local, fresh food, beer and wine, warm and welcoming service + marvelous entertainment make Django’s Rough Bar Café an unexpected dockside experience. Reservations are not necessary. Call 707-962-0100 for more information, but just get out there and GO. Click below to read Django’s story in print. Published in the Fort Bragg-Mendocino Coast Packet, December 1, 2015. Writer/photographer, Mary Charlebois.